First race of the season! I was so excited to do this race... perhaps excited isn't the right word more like "let's just do this already!" I really wanted to see if all the work I'd put in over the winter was going to payoff... well, did it?!? John Tanner Sprint is part of the Tri the Parks races series in GA. It is a great series of races, Chuck and Kristen, the race directors, do an amazing job and the races are always top notch! It's a great "first of the season" local race and a lot of folks show up. If you are planning to race a full season, you live in atlanta, and you aren't racing St. Anthony's, then you'll probably be racing at John Tanner. The atmosphere is almost like a reunion as you see folks you haven't seen since the last race of last season, you catch up... try to remember how to set up transition, etc. The other very cool thing about the tri the parks series, is that it attracts a lot of first timers. I love talking to first timers before a race. They are excited, nervous, etc. and I really enjoy hearing their stories about why they decided to do triathlon, answering questions and helping to set up transition areas, etc. Congrats to the two ladies that shared my rack in transition that completed their FIRST triathlon on Saturday!! I had a goal. A goal that, I felt, based on numbers in training was very achievable; if everything went right. I've been working hard and I've been seeing positive things in training. Race morning arrives, thunder and lightning all over the atlanta area... driving to the race I'm in torrential downpour and I'm thinking, there is no way we are having this race. Once I arrive at the race start, it's slowed to a drizzle. I've got some things from all3sports to drop off with Kristen so I get a chance to ask her about the weather forecast (chuck and the USAT official are hovering over the computer looking at the forecast). News from Kristen is that they expect a clearing between 8:00 and 10:00 enough time to get us out for the swim. Cool. Now to set up transition... as I mentioned before I had a great time talking with some first timers and I was feeling relaxed... maybe a bit too relaxed. Seriously, I had no nerves, completely not normal for me. Get my wetsuit and swim stuff together and head down to the water. I'm not so good with the open water swimming, so I require a really long swim warmup. Saw my new friend (and fellow trimasterscoach client) Casey lakeside. Always nice to have some help with the wetsuit zipper. Swim warmup goes well... I'm out there long enough to get rid of the panic feeling and put in to some solid swim "pick ups". Swim, swim, swim... kick in face, goggles fill with water, head out of water, flip up goggles, back on face, swim, swim, swim.... and then hyperventilate, panic starts to build.... slow down, get in a rhythm, breathe, swim, breathe, swim, breathe... I get in a rhythm, but I know it's slow, the positive? I didn't have to stop in the middle of the lake to catch my breath. By the time I feel like I can swim, I turn the last buoy and head to the finish. oh well, how bad can it be? Look at my watch at swim exit: 11:30... alright not great but not the end of the world... heading up to T1... can't get this wetsuit off my arms... argh! WTF!! this is ridiculous! I'm struggling with my wetsuit all the way into T1... I had a plan for getting the wetsuit off... it just wasn't working correctly. After completing my impression of an orangutan stuck to giant flypaper, I get my helmet, shoes, etc. Just as I'm about to grab my bike off the rack, I look up to see my coach, Laura. She says "that's not my bike!". Too funny, she had stopped at the wrong rack. My next thought... holy crap I'm slow, she started in the wave 3:00 behind me!! Oh well, can't worry about it now, let's ride! Off the bike onto the run... felt totally fine! Just started running as fast as I could, or at least as fast as I thought I could for 3 miles. The first part is a paved loop around the lake, then a super steep hill leads into the wooded, dirt (well, by this time mud) section. The rain is pouring again at the this point but I don't really notice. I'm slipping a bit in the mud but I'm just trying to stay focused on forward. There is an out and back section, so I start looking for the leading ladies... I knew there were a bunch of folks in front of me and I hadn't caught enough of them on the bike, but I wasn't so concerned with placing today (I knew there were a ton of fast ladies there) I just really wanted that 1:06 and I didn't know how far I was away from it. (when I was trying to get my watch to work prior to race start I reset it, and all of my data field settings were replaced, meaning, when I was on the run portion, I could only see how my run way going, not total time). leaning over the bucket holding the disposable water bottles I thought I might puke into it, but I was okay, just not ready to walk again yet. Took my chip off, accepted my water and started walking. How could that be? Nothing went wrong! no cramping, no swim panic, what happened?!?! It wasn't lack of effort, the HR number show that was working hard the entire race... I had a tough time with my wetsuit, but that wasn't 3+ min! so it was my bike, my bike, of all things, that let me down. My bike used to be my bread and butter... did I get cocky? did I stop pushing as hard during my workouts without realizing it? Or was it the rain that slowed my down, and if so, why didn't it feel like it out there? The positives from this race? Dude, I can finally run off the bike! I'm no longer running scared out there... I'm running with confidence and that's a nice change. As usual, its not just me out there... thanks to Alex for being a rockstar husband! and my coach for turning me into a runner again! Thanks Laura! It was great racing with you!! Thanks to all my friends that were out there cheering on Saturday and hanging out after the race. It was great racing with you all!! Thanks to the first timers for reminding me of the joy in just finishing the race. Thanks to Sarah H. for asking me after the race "did you have fun?" because, yes, yes, I did have fun! A Note on the Garmin: A couple of weeks ago my Garmin stopped picking up satellites. a call into Garmin support seemed to fix the problem. Called them up again, monday after race and told them about the issue on race day. They are replacing my unit with a new, hopefully functioning, one. Thanks Garmin! That is great customer service!! 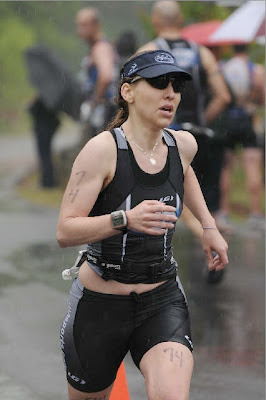 Ug, I had the same race on Sat. - felt great, was spot on, then the times were just not there. It was the bike that betrayed me too! Kati - I had the same though when I read your post today! Oh no we had identi-race again! Hopefully we've some good ones coming our way.